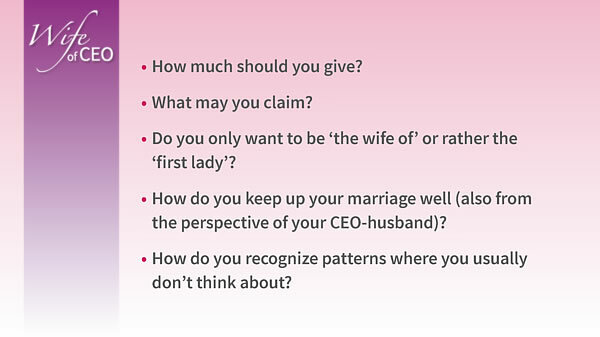 Are you always stuck in the hustle and bustle of your own life, dominated by the busy schedule of your CEO-spouse? As a wife of a CEO, I know that feeling too: that my personal life and family is determined by the busy schedule of my husband. My own working experience as a PA and later as business counsellor has made me aware how I can break through the impasses together with my CEO-man and can even improve our relationship. Since I more often join in international business trips, I am a better informed sparring partner and I can take a more private and suitable role. As a result, I get more understanding for his work and especially for the time pressure. In addition, I gain increasing insight in my own entanglement by his hustle and bustle! Are you also partner of a CEO and do you wish to shine in your role instead of ignoring yourself? 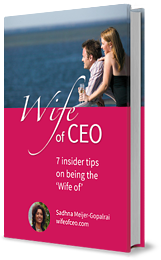 Download my free e-Book ‘Wife of CEO insider tips‘ with some practical suggestions. Are these suggestions appealing to you and would you like to change issues in your life structurally? Sign up for the online training program ‘Rise your power‘! Do you have specific questions and would you like to contact me personally? 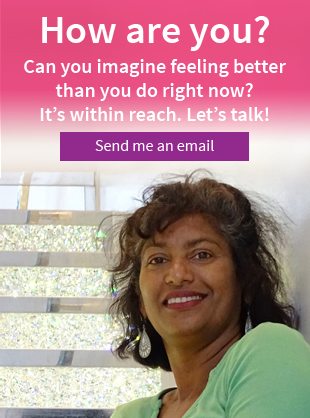 Mail or call me: sadhna@wifeofceo.com | +31 6 28249929. The Wife of CEO website is also available in Dutch; please visit vrouwvanceo.nl. Being visible, being supportive, being his sparring partner, being inspiring… Any woman, married to a business leader, realizes this role could lead to insecurity; she might also become a burden rather than a blessing. If you want to be more happy in this role: learn to take your stage! How? This and six other steps to self-reliance and a serene life I am explaning in a special eBook. Submit the form below and get it for free!